Morning Star offers many opportunities throughout the school year for students and parents to participate and volunteer in various sports and activities. Chapel – On Wednesday mornings at 8:30 during the school year, students and teachers have the opportunity to worship and praise the Lord together in our church. All are invited to join us for this special time! Worship – Students and parents are encouraged to praise and honor our Lord through regular church attendance. Please visit our church home page for worship service dates and times. Accelerated Reader – Students in grades 1-8 may choose to take part in this program where participants read books according to their reading level and take tests on what they’ve read to accumulate points and earn prizes over the course of the school year. 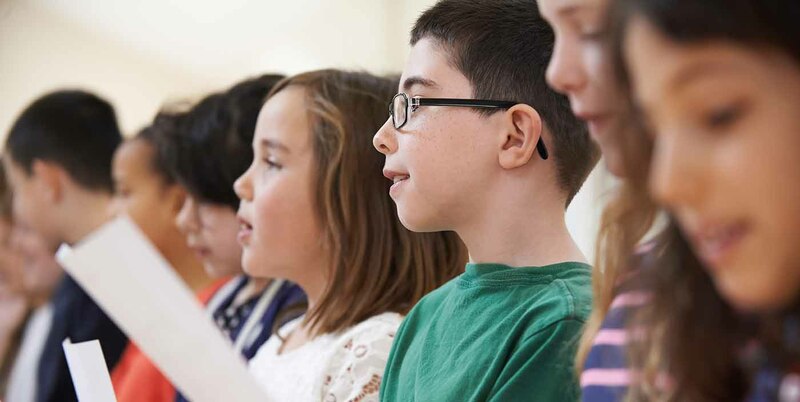 Classroom Choirs – All students in preschool through 8th grade sing with their classmates in worship services in church at various times throughout the school year. Entertainment Night – Musicals, plays, and/or skits are performed by students in April. Grades 5-8 perform in even numbered years; 3K-grade 4 perform in odd numbered years. Spelling Bee – The top 2 students in each grade from 5-8th grade participate in the Spelling Bee at KML in October. YOUth Praise Choir – Separate from the classroom choirs, this junior choir for 3-8th grade students practices once a week during the school day and sings in church services at various times throughout the school year. Field Trip Chaperones – Throughout the school year, classes occasionally take field trips off-campus and adults are needed to drive and/or chaperone. Parent Group – Made up of school parents, this group meets monthly during the school year to organize and oversee various events, groups, and programs at Morning Star such as Grandparents’ Day and book fairs, room parents, and the ordering of school spirit wear. Room Parents – Each classroom has room parents who organize classroom parties, field trip chaperones, teacher birthdays and gifts, etc.